Worse Than Tigers is a bone-chilling, panic-attack inducing, primal, bloody, life resuscitator…and its funny. It’s a theatrical “Black Mirror”. What happens when we anesthetize ourselves from all of our feelings, cauterize all emotions and live in a “safe” controlled, flatlined existence? Will our demons and dark sides make their presence felt at all costs? Will emotions literally coming knocking at our door? This play is a discourse on the repercussions of repressing all “negative” feelings. It’s sneaky. It engages your intellect with complex, clever, funny dialogue revealing marital detachment, and then it pounces like a stalking animal that’s been biding its time until you are vulnerable to its attack. It brings your untamed selves to the surface and encourages them to run wild. Director Jaclyn Biskup of The Mill, has crafted a tightly wound bobbin of tension. She brilliantly defined specific tempos for each emotional movement to keep a constant feeling of unsettled. She is gifted at lifting out the comedic moments as well as plunging into the meat of messy, raw emotional chaos to unearth the theatrical gems inherent in the text. Biskup’s strong directorial vision is evident in the intricate, sensitive character development and the stakes that she manages to keep high throughout the piece. Braeson Herold, as Humphrey, gives us a man anorexic of feeling and brittle from overt political correctness. He is quite sensational in the role. His character arch from frigid, blocked, self-emasculated, life avoider to shattered, bruised husband and father is miraculous. You literally see him transform believably from vampire, cold-blooded, unfeeling to robust, red cheeked, angry alpha. He also has funny bones and can sniff out comedic potential in the text like a truffle hog rooting out it’s gourmet fungi prize. Shannon Marie Sullivan as Olivia gives us a sexually starved wife on the verge of exploding. 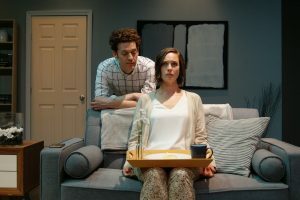 She portrays Olivia as a hard-edged woman who is channeling her grief into empty sexual exploits to hurt herself into feeling. Sullivan drives headlong into the boisterous emotions of lust, rage and inconsolable anguish and in the process ignites the audience into feeling deeply. It’s a beautifully layered performance. Zach Wegner as Kurt is a cannonball shot out of a carnival sideshow. His Kurt bounces off the walls avoiding boredom whilst “spraying” in all of the corners to mark his “territory.” Wegner has a huge presence and his character takes up the entire space, pushing the other characters up against the walls of their own making. His physical characterization is hilarious as he stampedes around the apartment asserting himself on top of the food chain. He literally brings the lifeblood back into the dried up veins of the married couple. Matt Carlin’s scenic design yells perfection in all of its awful implications. He places us slap bang in the middle of the situation with a stunning set that immediately makes you feel claustrophobic and aching for color. It is like he personified the couple’s emptiness in every tone, prop and furniture piece and then slowly let in the mess. The lighting design by Kate Ducey took us on a great emotional journey from hospital-ward type cold, harsh lighting to healthy-cheeked, hot, healing, warm halogen bliss. The costume design by Kristy Hall adorned the couple in the armor of conformity and the visitor, Kurt, in 50’s style T-Bird attire with a hint of Danny Zuko. I loved AJ Surasky’s sound design that made me feel like I had walked down the wrong path and come face to face with a hungry Bengal tiger. I’m still hearing her roar jangling my primal fear. It’s a tight, well-paced, excellent show with polished performances and high production value. It’s sort of like the Rhinoceros (Eugène Ionesco) of our age – but with a cathartic, happier ending. Running time: I hour 45 minutes with one 15- minute intermission.